Drugs, cigarettes and cash seized by Thompson RCMP. Thompson RCMP recently seized a quantity of drugs, cigarettes and cash as the result of a traffic stop within the City. On February 1, 2019, at approximately 9:05pm, as part of an ongoing investigation, RCMP stopped a vehicle on Churchill Drive in Thompson. 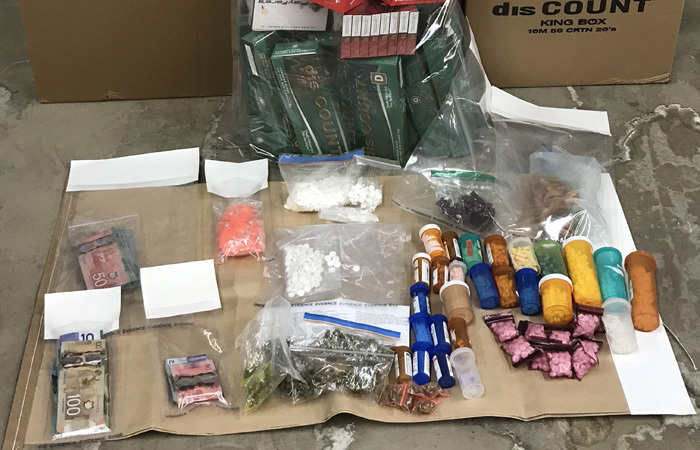 Police say that the male driver was arrested and a subsequent search of his person and vehicle resulted in a seizure of 186 flaps of crack/cocaine (approximately 85 grams), more than 1900 pills, including 387 oxycodone pills and 326 codeine pills, 41 grams of cannabis, a large quantity of cannabis edibles, approximately 32,000 illegal cigarettes, and a large amount of Canadian currency. RCMP remind the public that those who produce and traffic illicit drugs destroy lives, homes and communities. The Manitoba RCMP remain fully committed to enforcing laws against illicit drugs to their fullest extent.